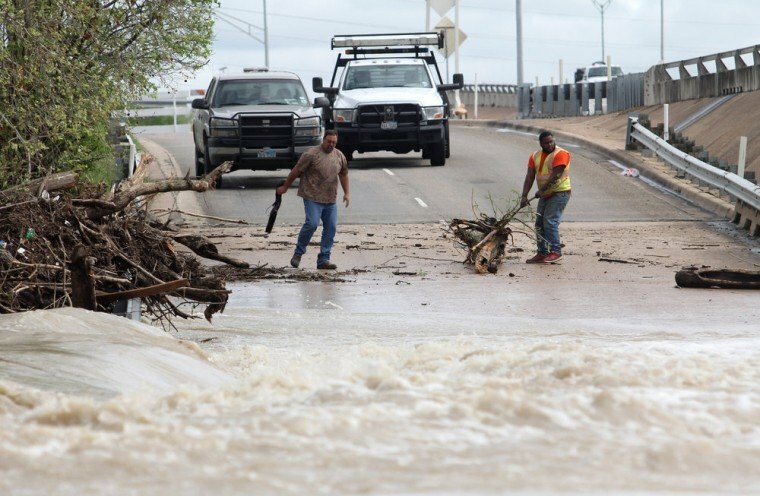 According to official reports, at least 17 people have been killed and dozens injured in Oklahoma and Texas following record rainfall over the weekend. At least four deaths have been blamed on the storm in the Houston area. The storm led to major flooding and tornadoes sweeping across the southern part of America. More heavy rains are expected over the next few days. Parts of Houston – the US’s fourth most populous city – remain under water. Thousands of cars have been abandoned on city streets and highways. Scores of residents have been displaced and more than 1,000 homes have been destroyed. The number of people killed in Texas and Oklahoma is expected to rise as more bodies are discovered, officials say. By May 26, most rivers in Houston were reported to have receded back within their banks. The floodwaters affected virtually every part of the city, officials say, bringing some areas to a standstill. Fire fighters rescued scores of stranded motorists and at least 2,500 vehicles were abandoned by drivers, officials said. Texas Governor Greg Abbott has declared a state of emergency in 24 counties in Texas. The bad weather does not appear to be coming to an end – forecasts have predicted a 20% to 40% chance of thunderstorms for the rest of the week in Houston. The effects of the massive storms were also felt near the Texas border in Mexico. On May 25, at least 14 people – including an infant – were killed by a tornado that hit the northern Mexico border city of Acuna. Mexican authorities said that more than 1,000 homes were damaged by the storm. Texas often experiences long periods of drought, despite heavy rainfall at times. As of the week of May 19, areas in central Texas were experiencing abnormal to severe levels of drought, with 795,851 residents affected, according to the Texas Commission on Environmental Quality.